I can be honest about my weaknesses, and I've just never been good at doing hair. My own, anyone else's. It didn't really seem to matter. I could leave it down or pull it partially back in a barrette, but that was the extent of my abilities. Getting ready for Grace's big girl haircut! You would think I would have been worried when Grace was born, but fortunately, she didn't really have any hair for more than the first year of her life. And even then, most of the bows had velcro, and you sort of just stuck them on her head. As she got bigger, it was still pretty easy to do her hair. Even I could pull it back just a little, and she still looked cute as a button. Kyle always went for the headband, and that was pretty cute too. Tina carefully cuts off her ponytail. She was excited to get her hair cut. Since her hair did grow pretty fast, one of our favorite activities was participating in the Old Settlers longest pigtail and ponytail contest. She won a ribbon in her age division every single year. Grace was pretty impressed with her ponytail. But the last couple of years, it was getting long. I mostly went with a ponytail and a princess or Minnie Mouse bow. It didn't always look great, but at least it kept it out of her face during preschool and therapy. On occasion, I would do pigtails because they were one of Kyle's favorite looks. A new bow for a new look! The drawback to having fine hair though, is lots and lots of tangles. And Grace would cry when you would wash or dry her hair, and just sob when you would try to comb it. Mommy got to hold up her ponytail too! So, as cute as her long hair was, we started talking about getting it cut. And since it was so long, we talked about donating it to charity. The more we talked, the more excited we got. Then I decided I would let mine grow out until it was long enough to donate too. 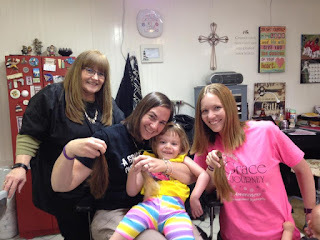 As we started looking at when we would get it cut this spring, Kyle's sister, Mikaela said she wanted to join us too. So, it took some scheduling, but Mikaela joined as at Hair Designs in Coffeen on Friday, May 20, where Tina Leefers did the honors. Tina has been my hairstylist forever, and did Grace's first haircut, so we knew she would help us out on this special day. Then, it was Aunt Mikaela's turn! I asked Tina to find a place we could donate to, where they accepted eight-inch ponytails, and she found a non-profit organization called Children with Hair Loss, that provides free hairpieces to children with a wide range of medical illnesses, including cancer. When we arrived at Tina's, we decided that Grace should go first, and I held her on my lap. To date, Grace had only really had her bangs trimmed, and Tina usually has to do it while Grace was shaking her head no. Let's just say Tina is a woman of many talents! But Grace actually did pretty good, and seemed to like it when the hair would brush her face. Tina carefully measured an eight-inch ponytail of blonde hair, and Grace was left with a cute chin-length haircut that framed her face. It was fun to hang out with Daddy, Grace and Quincy at Tina's. I went next, and had about eight inches to donate as well. My haircut is about the same length as Grace's, and I must say it's been a long time since my hair had been too short to pull into a ponytail. But it's a really cute look, and still doesn't require a lot of ability to style it. Although I use the word "style" in a very loose way. Finally, it was Mikaela's turn. She had the most hair of any of us, and was left with a shoulder-length cut. She likes to be able to pull hers into a ponytail at work, so it's good that hers was a little longer. Kyle, Grace and I entertained Quincy while Mikaela got hers cut, and that was a lot of fun. Before we left, the three of us posed for a photo in the newspaper with Tina, who did an awesome job on all three haircuts. And it was such a fun afternoon to be together. That hair will help make hairpieces for children who need it! 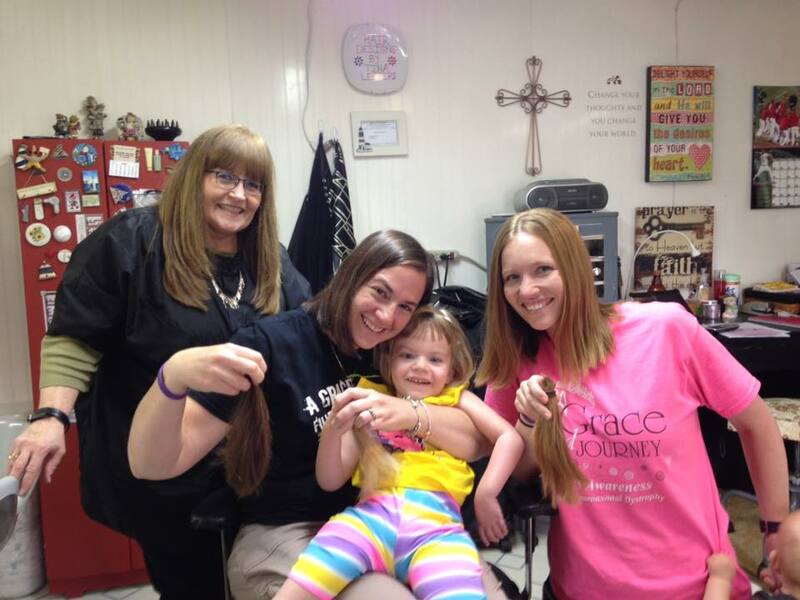 The day after the photo ran in the newspaper, I got a message from a local resident, who thanked us for picking Children with Hair Loss, as they provide a hairpiece for her daughter. She told me they are an amazing organization to work with, and she was glad we donated. I was glad to hear they help local people too. We know that Grace has touched many lives in her four and a half years, but we want to give her every chance to help others and make a difference. I can only imagine some little girl with a new blonde wig, using Grace's hair. It makes my heart leap with joy. All finished and looking beautiful! She looks so grown up in her new haircut, but it's much easier to brush now. We've both gotten lots of compliments on our new hairstyles, and as long as they don't say I look more grown up, I'll be doing great!